As a counter to these ideas of ecological triage, some conservation biologists believe that parallels between emergency medicine and conservation biology are inappropriate. For example, they consider that it makes extinction acceptable and allow decision-makers to get away with allocating insufficient resources to address environmental problems. More than a decade ago, scientists Cameron and Soderquist argued in Nature that nations such as Australia should reject the concept of ecological triage because it is has the knowledge, time and ability to save threatened and endangered species. Prime Minister Tony Abbott has reaffirmed his commitment to seek to remove 74,000 hectares of Tasmanian forest from the World Heritage List as part of a "renaissance of forestry" in the state. The newly-elected Liberal Government in Tasmania, led by Premier-elect Will Hodgman, has promised to rip up the state's Forestry Agreement as well as re-open listed forests to logging. Under the Tasmanian peace deal, 170,000 hectares of forest was added to the World Heritage area. Mr Abbott says the Federal Government is committed to growing the forestry industry in the state. "We want to see a renaissance of forestry in Tasmania," he said. "Will Hodgman wants to see a renaissance of forestry in Tasmania and we'll work very constructively with the new state government to try to make that happen." The Prime Minister declared earlier this month that too many of Australia's forests are "locked up". He has vowed to set up a new advisory council to support the timber industry. "We have quite enough national parks. We have quite enough locked up forests already. In fact, in an important respect, we have too much locked up forest," Mr Abbott told a timber industry dinner in Canberra earlier this month. 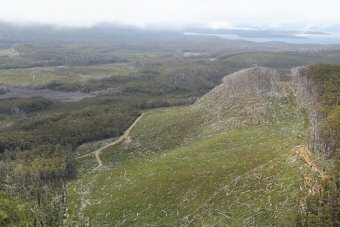 The Federal Government argues part of the land locked up in Tasmania's World Heritage area has already been partially logged or degraded and it should be opened up to the forestry industry. Tasmania's Liberals posted their best-ever election result on Saturday night, claiming at least 14 of the 25 seats on offer on the back of a 12 per cent swing. It ends Mr Hodgman's reign as the country's longest-serving opposition leader. Opposition Leader Bill Shorten believes state Labor's power-sharing deal with the Greens cost the party at the ballot box. After 16 years in power Labor suffered its worst result in six decades, winning 27 per cent of the vote and just six seats. Premier Lara Giddings dumped the Greens from Cabinet shortly before announcing the election date. Mr Shorten says the years in partnership were not good for the Labor brand. "In Tasmania the Labor government had been in for 16 years that's a very long time and there's no doubt that Labor having an agreement [with the Greens] was marked down by Tasmanian voters," he said. Meanwhile, the state's electoral commission has revealed 163 postal votes were destroyed after they were irreparably damaged by a letter-opening machine. More than 2,300 ballot papers for the Hobart-based seat of Denison were damaged during preparation for the count on Saturday evening. The Tasmanian Electoral Commission (TEC) said 2,175 ballot papers were repaired but 163 were damaged so badly they had to be counted as informal. The incident has been blamed on the machine not being used properly and poor quality control. State Electoral Commissioner Julian Type said it was not likely to impact the result. Fairytales of the forest could have an unhappy ending for Tasmania's jobless, as the Prime Minister will soon learn. Tony Abbott recently described the people who take the chainsaws to Tasmania's native forests as ''the ultimate conservationists''. Seriously. In his speech to the 2014 Forestworks Dinner, the Prime Minister claimed that because the loggers' future income depends on the availability of trees, they - and not the derided greenies - are the true custodians of our wilderness. By that logic, the men who fire explosive-tipped harpoons into whales in the Southern Ocean would fit the Abbott definition of ''real conservationists''. Indeed, any self-respecting rhino poacher in Africa must surely see themselves as a far-sighted conservationist. But the illogic of the Prime Minister's speech didn't stop there. Having defined the native forest loggers as the real conservationists, Mr Abbott went on to explain that his government's determination to remove 74,000 hectares of Tasmanian forest from the World Heritage Listing was based on the fact the areas were no longer ''pristine'' because, wait for it, some of them have been previously logged. It seems that whoever wrote the first part of the speech didn't bother to talk to whoever wrote the second part, and in turn that the Prime Minister didn't read it before he gave it. Surely a Rhodes Scholar would have picked up a howler like that? Or perhaps not. Maybe in the modern political world the debate moves so fast that facts and consistency are not as important as headlines and campaign bunting. But even if the modern political speech is nothing more than a sound-grab looking for a photo opportunity, Mr Abbott's recent effort deserves closer scrutiny. It may well be the silliest speech given by a prime minister in recent years, but it certainly tells us a lot about his world view and the kind of decisions he is likely to make. As with his approach to foreign policy, this speech assures us the Prime Minister sees economic debates in terms of ''goodies'' and ''baddies'' as well. When it comes to Tasmania's forests, the ''goodies''' in this speech were obviously the ''ultimate conservationists'' - also known as the loggers. And the ''baddies'' in the story were the environmentalists who want to ''lock up the forests''. The baddies, we are told, want to ''ban men and women from enjoying'' the environment, while of the goodies, Mr Abbott says, ''you intelligently make the most of the good things that God has given us''. By that he presumably means knocking down trees with bulldozers and dropping napalm from helicopters on what's left behind. Having introduced the heroes and villains of his story, the Prime Minister's speech turns to the ''great quest''. Along with our heroes the loggers, Mr Abbott simply wants to create jobs and prosperity for the people of Tasmania. But to succeed in this mission, he must first vanquish the villains who have been holding Tasmania's jobs captive in their World Heritage-listed forests. ''We want the timber industry to be a vital part of Australia's economic future,'' he told the loggers. But this is where the fairytale and economic reality begin to diverge. While there is no doubt Mr Abbott and the loggers want the logging industry to grow, the problem is the overseas customers don't. The world is buying less timber as more high-rise housing is built from concrete and steel, and when the world does buy timber it prefers softwood such as pine rather than the hardwoods found in Tasmania's magnificent forests, and when the world's consumers do want hardwood they prefer it to come from plantations rather than native forests. The car industry is leaving Australia because the world doesn't want to buy the kind of cars we like to make and because overseas consumers can get the cars they do like from cheaper places than Australia. While Mr Abbott has said no government ever subsidised their way to prosperity, and Treasurer Joe Hockey has said he wants to end the age of entitlement, the Coalition government seems determined to prop up the Tasmanian native forest loggers while waving a cheerful farewell to the car industry. Over the past 25 years, the loggers have received more than $750 million to ease the pain associated with the fact the world doesn't want to buy their product any more. When digital cameras replaced film cameras, the photo development labs didn't get a cent. But despite the fact the loggers' falling fortunes have been softened by an enormous mattress made of taxpayer cash, the Coalition is now painting the loggers as the victims. While the brave loggers battling against the evil greenies may well make for the kind of simple story political strategists love these days, such stories do nothing to help the 19,000 unemployed people in Tasmania. Given that native forest logging employs only about 1 per cent of Tasmanians, it should come as no surprise the vast majority of Tasmania's jobless have never, and will never, work in the native forest logging industry. 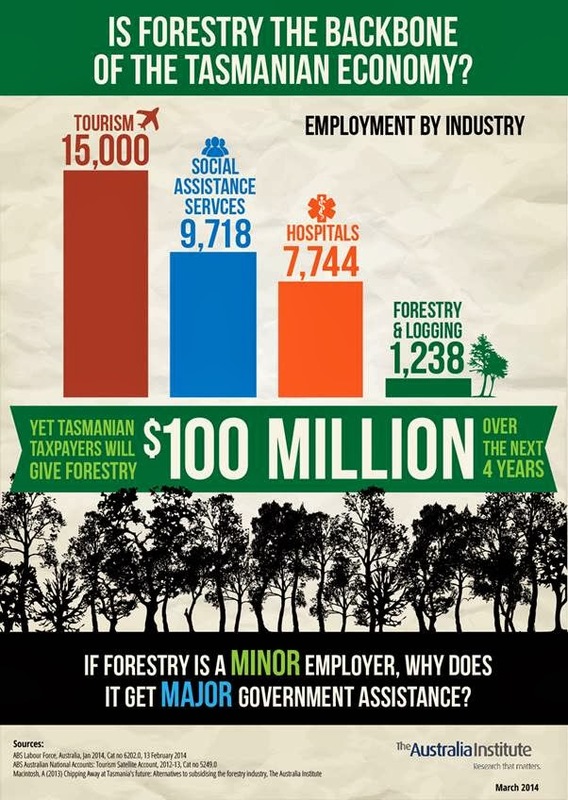 While in the vacuum of modern political debate being ''anti-environmentalist'' means you must be ''pro-jobs'', the reality of the Tasmanian state economy is that 99 per cent of the population are not employed in native forest logging. Even if the Prime Minister's strategically selected sound bites combined with another truckload of taxpayer cash managed to double the size of the native forest logging industry, it would still be a tiny employer. Indeed, even at twice its current size, native forest logging would still be dwarfed by the tourism industry, and Tasmania's unemployment rate would still be the highest in the country. Tasmania used to be the hub of whaling on the east coast of Australia. Men with saws once cut enormous trees and sold Australia the wood we once wanted. But, as with whale oil, the Australian public doesn't want to buy native forest hardwood any more. If they want hardwood, it's cheaper and better for the environment to get it from plantations. And when the world's paper mills want woodchips, they prefer the cheaper plantation product too. There is nothing to stop the Prime Minister telling himself, or the public, fairytales about goodies and baddies and the quest to find jobs in magical forests. But there is no chance such stories will solve Tasmania's problems. Mr Abbott promised to create a million new jobs before the last election, and so far he is lagging badly. Speeches such as last week's might gee up the troops and shift the blame, but they do nothing to solve the underlying problems. ENVIRONMENTAL groups and timber workers have joined forces in launching a last-minute plea for the Liberals to change their mind on ripping up the Tasmanian Forest Agreement. Signatories to the peace deal said yesterday the Liberals would be taking the state back to the bad old days of the forest wars that tarnished the state for decades. But the Liberal Party yesterday remained unmoved and reaffirmed its belief it would have a mandate to rip up the agreement if it sweeps into power tomorrow. The calls come as a Newspoll shows the Liberals are headed into the election in considerably better shape than 2010. In the week before the 2010 election, which resulted in Labor and the Liberals securing 10 setats each and the Greens five, the polling results were tigher — the Liberals holding 39 per cent compared with Labor (36.9) and the Greens (21.6). The Newspoll, undertaken this week and published in The Australian today, shows the popularity of the Liberals at 53 per cent compared with Labor (23 per cent) and the Greens (16 per cent). Opposition leader Will Hodgman said he would not be bullied on the forestry issue. “We do not support the forest deal, it failed on so many fronts,” Mr Hodgman said. “I am in no doubt we can continue to sell our world-class products including those out of our forests. CFMEU national president Forestry & Furnishing Products Division Jane Calvert joined forces with the environmental groups yesterday calling on the Liberals to rethink their vow. CFMEU spokesman Jane Calvert wants the Liberals to rethink their pledge to rip up the forest peace deal. “When the timber workers’ union sat down to break bread with our traditional enemies — the conservationists — back in 2010, we did so for good reason,” Ms Calvert told the Mercury yesterday. “The agreement and its legislation are far from perfect. “But in the four years since talks began, no political party, political leader or critic of the agreement has put forward a credible alternative to address the impending change in resource, shifting market preference and need for investment. Wilderness Society spokesman Vica Bayley and Environment Tasmania spokesman Phil Pullinger appeared to be choosing their words carefully yesterday, stating they were still committed to the agreement. But the pair also made it clear they could no longer offer their support, and endorsement, to overseas and domestic markets if reserves under the agreement were scrapped by the Tasmanian Liberals. “It does not take too much creativity from any of us to think about what will happen if they start logging World Heritage forests,” Mr Bayley said. ENVIRONMENT groups have stepped up the pressure on the Liberal Party, warning there will be no such thing as non-contested wood if the Tasmanian Forests Agreement is torn up. At the final stage of the election campaign, the Wilderness Society and Environment Tasmania urged the Liberal Party to rethink their plan to tear up the deal, but stopped short of issuing a threat. "It is the Liberal Party that will be making a choice to remove the capacity for the industry to have a stable future," Dr Phill Pullinger said. "This is a package deal. It was, it is, a finely-balanced agreement, and you can't pull out one thread." The groups have welcomed timber veneer company Ta Ann Tasmania's commitment to only source wood from outside areas that are protected under the deal, even if the Liberals reopen them to logging. However, that doesn't guarantee support for the company's products made from the so-called "non-contentious" areas, if it's not underpinned by the TFA. "The whole industry becomes contentious again," Wilderness Society spokesman Vica Bayley said. He rejected the Liberals' claim to have a mandate to unwind the agreement. Liberals forestry spokesman Peter Gutwein said he would not be "greenmailed". "Threats by environmental groups that the Liberals plan to rip up the sham forestry deal will reignite protests will not sway a majority Liberal government from taking the action needed to rebuild our forest industry," Mr Gutwein said. Labor has vowed to continue to implement the Tasmanian Forests Agreement. That is the key plank of the party's forestry policy unveiled yesterday at Ta Ann's Smithton mill. Deputy Premier Bryan Green said a re-elected Labor government would also negotiate a new regional forest agreement with the Commonwealth. The policy includes $5.8 million in new spending, including money for research into plantation products, $1.5 million to offset costs of transporting forest residues to Bell Bay, and more assistance for workers. Mr Green said the Liberals had failed to provide a credible alternative. Conservationists have been ordered to rip down a tree house in a state forest north-east of Melbourne that was built to highlight the plight of Victoria's faunal emblem. Mansfield Magistrates Court ruled on Wednesday that the bright red tree house, built last year to protest against logging in the Toolangi State Forest, be removed. If the unidentified owner of the 14-square-metre structure does not pull it down within 28 days it will be forfeited to authorities for disposal. The Department of Environment and Primary Industries said every effort was made to identify the owner and reach a solution without going to court. Friends of Little Red Toolangi Treehouse spokeswoman Amy Calton, who is part of the ground crew at the site, said the group had not decided whether to comply with the order to tear the treehouse down. 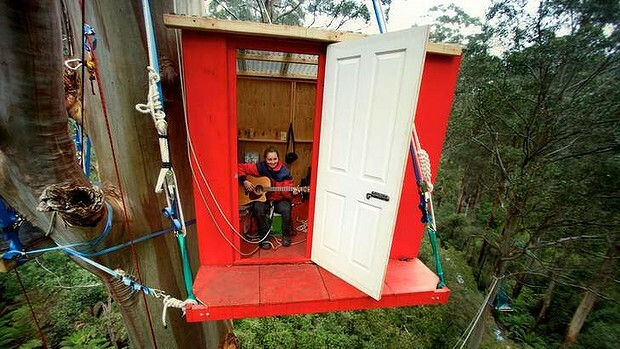 Ms Calton criticised the department for taking legal action, saying the tree house never threatened logging activities. “It's simply there to point the finger at destructive logging practices going on in the state,” she said. The tree house is perched 30 metres off the ground in a pocket of mountain ash forest that forms vital habitat for the critically endangered Leadbeater's possum. Since November activists including Hannah Patchett have maintained a vigil by living in the structure to raise awareness about the threat of logging to the species of possum, which lost almost half its habitat during the 2009 Black Saturday bushfires. Conservationists said the treehouse stood as an “environmental beacon” that raised awareness about logging practices in Victorian forests. Friends of Toolangi Forest spokesman Bernard Mace said the court ruling marked a “sad day” for supporters. “The tree house is a focal point for the conservation movement and symbolises the courageous and creative efforts of environmentalists striving to protect native forests from VicForests' clearfell logging operations,” he said. VicForests declined to comment about the case. PHOTO: The Coalition Government vowed to reduce the World Heritage area as part of an election commitment. A key advisor to the World Heritage Committee has flagged concerns with the Federal Government's plan to delist 74,000 hectares of Tasmania's World Heritage Area. In 2013, the committee approved an extension to the area, adding about 172,000 hectares to take the total protected area to about 1.6 million hectares. The Federal Government vowed to reduce the area to help Tasmania's economy as part of an election commitment. As part of the World Heritage Area boundary change, areas of the Southern Forests, the Styx and the Florentine were given protection. The Government has said areas of genuine high conservation value are not part of the delisting plan, including tall forests in the Great Western Tiers. A Senate inquiry is investigating the issue and in a submission, the Australian arm of the International Council on Monuments and Sites said it believed allowing the reduction in the area would likely reduce the credibility of the World Heritage listing. The council is one of three advisory bodies for the World Heritage Committee and provides evaluations of cultural and mixed properties proposed for inscription on the World Heritage List. "We are alarmed that this proposal ... fails to respect that due process was followed by the World Heritage Committee and that Outstanding Universal Value has been established as a prerequisite for the decision to support the 2013 Boundary Modification," the submission said. We hence query how the Australian Government states it believes the excision of identified areas from the property will enhance the credibility of the World Heritage Listing. "We hence query how the Australian Government states it believes the excision of identified areas from the property will enhance the credibility of the World Heritage Listing. "The opposite seems more likely." The council's submission said it was too early to suggest any changes to the boundaries. "As the Australian Government is to submit a progress report on this assessment of cultural values ... in 2015, it is premature to be proposing any modification before that time," it said. "The evaluation of cultural values is a priority and no boundary modifications should be considered until that report is provided." In its submission, the Institute of Foresters of Australia said the World Heritage Committee made its 2013 decision based on a flawed assessment from the previous federal government. "The process and conclusions were in fact a hasty and superficial analysis of conservation values where no peer review was undertaken," it said. "Many claims and conclusions were based on limited information. "These claims were open to scientific interpretation and, in many situations, have been shown to be in error." The IFA said it supported a reassessment of the 2013 decision. Environment Minister Greg Hunt last month said he supported most of the 2013 extensions to the World Heritage area, but that large parts had already been logged. Mr Hunt said the area was added amidst "enormous local controversy" and was against the wishes of some in the community. "What has been put to the committee for reconsideration is 117 degraded or logged areas, so these were areas that many people feel should never have been added because they significantly detract from what is one of the great World Heritage Areas," he said at the time. Mr Hunt has been contacted for comment. Tasmania's forest peace deal was designed to end decades of conflict. Under the deal, environment groups are supporting the timber industry in exchange for old growth forests being protected in the 172,000 hectare boundary extension. Tasmania's Liberal leader Will Hodgman has said he will tear up the agreement if he wins office in Saturday's election. Meanwhile 114 members of the World Commission on Protected Areas (WCPA) have written to the Prime Minister, criticising his comments that Australia had "enough national parks". Tony Abbott told a timber industry dinner this month that too many of Australia's forests are "locked up". The WCPA's vice chair Marc Hockings says those remarks triggered serious concerns among its members, prompting the commission to take the "unprecedented" step. "This was really the most recent in what we see as a large number of examples where governments around Australia have been stepping back from a commitment to national parks and protected areas," he said. "Even though WCPA is very much a non-political organisation, we needed to stand up and strongly make the point that national parks and protected areas are really important for our society." The WCPA is a body of experts that advises governments and organisations around the world on conservation issues. Lawyers, scientists and conservationists were among 114 Oceania members to sign the letter. The commission is part of the International Union for Conservation of Nature (IUCN), which is also one of the key advisors for the World Heritage Committee. But Professor Hockings says they are completely disconnected from the committee's upcoming decision about the Tasmanian forests or Great Barrier Reef. "The decisions and recommendations of IUCN that will go to the World Heritage Committee meeting are not prepared by the Australian members of IUCN," he said. "But I think that's another example of the way in which we've seen the retreat from a commitment to protected areas." The Prime Minister's office has been contacted for comment. Tony Abbott was going to plant trees to combat climate change. Now he threatens them by his cavalier attitude to our national parks. The ''green army'' will face confusion. I think it is time we sent Mr Abbott the Dr Seuss book The Lorax. Next Mr Abbott will be telling us the Japanese whalers are the ''ultimate conservationists''. TONY Abbott’s push to scrap parts of the World Heritage Area risks scaring off Tasmania’s world markets, the Labor Party has warned. Critics warned the Prime Minister’s push to unlock parts of the WHA and create a new forestry advisory council would reignite the forestry wars, send jitters through markets and cost jobs. Deputy Premier Bryan Green and former Forestry Tasmania managing director Bob Gordon, who is running as a Labor candidate in Lyons, said Mr Abbott’s stance would do more harm than good. “I think any move to remove areas that are already World Heritage runs the severe risk that Tasmania will lose its forest certification,” Mr Gordon said at his campaign launch yesterday. Mr Gordon said any product harvested from an area that was once WHA would “never be purchased by any customer in the world”. Mr Green warned Australia would be internationally embarrassed if it repealed a WHA listing. “The Liberals are suggesting that by repealing world heritage and high conservation forests that that will somehow save the industry. That’s rubbish because what chance would Tasmanian timber from those areas ever have of being sold anywhere around the world?” Mr Green said. The comments follow Mr Abbott’s speech to a forestry industry dinner in Canberra on Tuesday night, in which he said too much of Tasmania’s forests were “locked up”. Mr Abbott outlined the Federal Government’s push to revoke the recent addition of 74,000ha into WHA listing. “We don’t support, as a Government and as a Coalition, further lock-ups of our forests,” Mr Abbott said. Wilderness Society spokesman Vica Bayley said Mr Abbott was courting conflict. Australian Workers’ Union national secretary Paul Howes, who was in Hobart yesterday, said Labor knew how to protect the environment and jobs. Prime Minister Tony Abbott has declared that too many of Australia's forests are "locked up" and vowed to set up a new advisory council to support the timber industry. Speaking at a timber industry dinner in Canberra last night, Mr Abbott also recommitted to repealing part of Tasmania's Wilderness World Heritage Area made under the forest peace deal. His comments have prompted anger from the Greens, who have labelled him the "dig it up, cut it down Prime Minister". "We don't support, as a Government and as a Coalition, further lock-ups of our forests. We just don't support it," Mr Abbott said. "We have quite enough national parks. We have quite enough locked up forests already. In fact, in an important respect, we have too much locked up forest. "Why should we lock up as some sort of World Heritage sanctuary country that has been logged, degraded or planted for timber? "Getting that 74,000 hectares out of World Heritage Listing, it's still going to leave half of Tasmania protected forever, but that will be an important sign to you, to Tasmanians, to the world, that we support the timber industry." Do you think Australia has enough national parks and protected forests? Have your say. Mr Abbott told the dinner that Tasmania's forest workers have a friend in Canberra. "When I look out tonight at an audience of people who work with timber, who work in forests, I don't see people who are environmental vandals; I see people who are the ultimate conservationists," he said. "And I want to salute you as people who love the natural world, as people who love what Mother Nature gives us, and who want to husband it for the long-term best interests of humanity." But Greens leader Christine Milne says the Prime Minister's words send a clear message to the world "that Australia does not value its world heritage areas or its national parks". "People are going to be pretty upset that Tony Abbott is mounting this massive assault on the environment," she said. Any move to repeal the World Heritage classification on Tasmanian forests would ultimately prove destructive to the state's logging industry, she added. "Tony Abbott has got it so wrong. The logging industry was on its knees in Tasmania because around the world nobody wants to buy timber products that come from old growth forest," she said. "There's now a high level of recognition that we need to be protecting the last of our primary forests around the world." Senator Milne said a recent "peace deal" with Tasmania's conservation movement had given loggers "some chance of a future in the plantations", but that Mr Abbott had threatened to "send Tasmania back to decades of conflict". "What he'll actually do is destroy the forest industry, not to mention Tasmania's clean, green and clever brand which is our main asset and that comes from our World Heritage area," she said. Mr Abbott also used his address criticised the Tasmanian Greens for everything from the state's ailing economy to its poor educational outcomes. "We all know Tasmania has the lowest wages in Australia, it has the lowest GDP per head, it's got the lowest life expectancy, it's got the lowest educational retainment in the country and it's got the highest unemployment, and funnily enough for the last eight years it has had a government in large measure dominated by the Greens," he said. While appointments to the new Forestry Advisory Council are still being finalised, Institute of Foresters national director Rob De Fegely has been named as co-chair. Is forestry the backbone of the Tasmanian economy? Prime Minister Tony Abbott has said he will not support the creation of any more national parks in a speech lauding timber workers as "the ultimate conservationists". Mr Abbott also told a timber industry dinner on Tuesday night that he would create a new Forestry Advisory Council to support the industry. The council will be co-chaired by Rob de Fegely, President of the Institute of Foresters Australia. Mr de Fegely is former Liberal Party election candidate for the seat of Eden Monaro. ''We don't support, as a government and as a Coalition, further lockouts of our forests,'' Mr Abbott said. Mr Abbott said the federal government was pushing to delist a world heritage listing of 74,000 hectares of forest in Tasmania. Mr Abbott said the area – which was protected under Tasmania's forest peace deal – was not pristine forest and was too degraded to be considered a sanctuary. Tasmanians go to the polls on March 15 with jobs and the forestry industry big issues as Labor struggles to hold onto government. ''I don't buy the Green ideology, which has done so much damage to our country over the last couple of decades and I'm pleased to see that there are some sensible Labor Party people who don't buy it either,'' Mr Abbott said. ''[W]hen I look out tonight at an audience of people who work with timber, who work in forests, I don't see people who are environmental bandits, I see people who are the ultimate conservationists. Mr Abbott said Canberra would now be ''friendly country'' rather than ''hostile territory'' for the forestry industry following the change of government. Australia’s forest advocacy groups have responded to Prime Minister Tony Abbott's attack on forests and praise for the industry that destroys them. 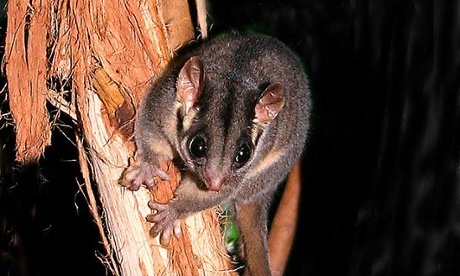 Many of Australia’s forest conservation groups have been working to have the remaining forests and the wildlife within them protected over the decades. WA Forest Alliance spokesperson Jess Beckerling said, “Fancy thinking that loggers, who are clearfelling ancient ecosystems at taxpayers’ expense, are the ‘ultimate conservationists’. It goes to show that the Prime Minister has no idea what protection of Australia’s most precious places even means. Tony Abbott is running a shameless attack against the places we love; our forests, marine parks, the Great Barrier Reef. It's no wonder we're seeing a resurgence of peaceful direct action around the country." Peg Putt, CEO of Markets For Change, said, "The Prime Minister's determination to log precious native forests when it is documented to be ecologically unsustainable jeopardises the markets of the forest industry which these days demand high environmental credentials in the wood products they sell." "He would assist the industry into a viable future more effectively and create more secure jobs if he supported utilising existing plantations for value added product and took the pressure off nature, Peg Putt said. "Converting the ailing woodchipping export trade into industrial scale incineration of forests to produce electricity is a plan that will harm the climate and horrify consumers," Peg Putt said. “If there was an international court to try the world’s worst environmental criminals Tony Abbott would be in the dock! He is an appalling/embarrassing example as the leader of a developed nation, at a time when the world’s natural environments are all under extreme stress,” Jill Redwood said. “Forests are critical in the fight to moderate our climate. There are plantations enough ready to process right now into sawn timber as well as woodchips for paper, without the need to cut down one more stick of native forest” said Jill Redwood. Tim Gentles from Goongerah Environment Centre said, "The Abbott government has shown themselves to be dangerously irrational when it comes to the economic and environmental reality of native forest logging. Tony Abbott appears happy to undo the protection of our loved and iconic forests whilst allowing millions of taxpayer dollars to disappear for the benefit of offshore companies like Ta Ann and Nippon Paper." IT IS no surprise to the forest and forest-products industries that some researchers seek to use narrowly defined research to support their aim of destroying forestry and the 40,000 regional jobs it sustains; but it is rather more disappointing that The Canberra Times fails to provide readers with any counter view. (''Young forests threatened by fires, logging'', February 23, p9). Had the reporter made an effort to contact the Canberra-based peak industry group for forestry, I could have provided any number of eminent scientists to show that forestry is helping save our bush. For example, readers would be interested to read that the IPCC (Intergovernmental Panel and Climate Change) says a working forest (which includes timber harvesting) provides the best carbon store over time. While it's reported that the forum's organiser said he brought together forestry experts to push for evidence-based forestry policy, it is a shame that The Canberra Times chose to print only one side of the debate.